Minutes from the twin cities of McCaysville GA and Copperhill TN. You can stand in Two States at Once. Escape from the city to Wildwood River Retreat. 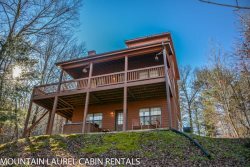 Sitting on 3 secluded acres along the banks of the Toccoa River, the sounds of the river and the brisk mountain air welcome you to the perfect setting to enjoy the serenity of the North Georgia Mountains. Upon arriving, step onto the river deck overlooking the beautiful Toccoa, sit, relax, and view wildlife and bird watch from this deck as many different critters pass by in the woods or on the river. The open concept Living Room and Dining Area is the perfect spot to gather and relax after a day of adventure. Enjoy the warmth of the wood burning fireplace and the view through the large window wall to the river flowing by just feet away. Other entertainment options include the large screen TV, with Blu Ray players, DishTV and WiFi available in all rooms. This beautiful new home offers 2 bedrooms both with queen beds, river views, and 2 1/2 baths. The master bath has a large tub with room for 2 to soak away the aches and a beautiful tile shower. The second bath includes a large shower. The 1/2 bath in the basement can be used as you enter and exit the hot tub. We’ve not forgotten any of the conveniences of home with a modern washer/dryer located in the Master Bath. Outdoors, guests can soak away their troubles in the hot tub on the lower covered deck while watching the Toccoa flowing by. Just steps away, a fire pit waits to provide warmth on cool evenings. Take a long hike or just a casual stroll on the path along the rivers edge. For fishermen, the river is considered to be one of Georgia's finest trout streams. The cabin was beautiful, will come back next year!